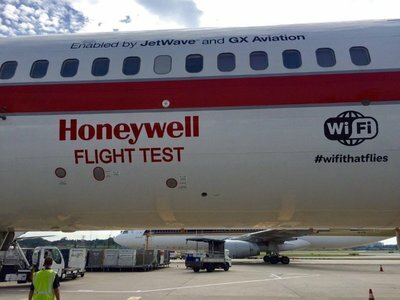 Phoenix, Arizona, USA - March 26, 2018 - Honeywell (NYSE: HON) announced today that it is providing business jet, airline and helicopter operators with better connectivity choices thanks to the introduction of the Aspire 150 and Aspire 350 satellite communications systems. With Aspire 150 and 350, pilots can maintain up-to-date information throughout their flight path, and operators can use this Connected Aircraft technology to experience global, seamless high-speed connectivity in a small, lightweight solution. Honeywell (NYSE: HON) announced today that it is providing business jet, airline and helicopter operators with better connectivity choices thanks to the introduction of the Aspire 150 and Aspire 350 satellite communications systems. With Aspire 150 and 350, pilots can maintain up-to-date information throughout their flight path, and operators can use this Connected Aircraft technology to experience global, seamless high-speed connectivity in a small, lightweight solution. The Aspire 150 and 350 systems are simple to install, minimizing upgrade costs and aircraft downtime. Both new Aspire systems are also smaller than previous generations and have an embedded router, which helps reduce weight and boosts fuel savings. The newest Aspire systems will provide Iridium Certus services, Iridium's next-generation communications platform, on the new Iridium NEXT network. One of the largest technology upgrades ever completed in space, Iridium NEXT will complete its launch in 2018, replacing the existing Iridium network to meet the growing demand for global mobile communications. By using Iridium Certus services, operators can reduce costs by up to 30 percent compared with legacy satellite communications offerings. Aspire 350 also supports global Future Air Navigation System (FANS) datalink for pilots to take advantage of preferred routing worldwide, and satellite voice capabilities. "Aspire 150 and 350 build upon the success of our previous systems in the air transport, business jet, military and helicopter markets," said Warren Nechtman, vice president, Connectivity Systems, Honeywell Aerospace. "These latest additions to the Aspire product line provide an easy upgrade for aircraft with or without previously installed satellite communications equipment, increasing both cockpit and cabin connectivity and enabling faster data speeds. And with an easy installation, operators can upgrade to seamless, high-speed cockpit communication that fits their exact needs and budget." The Aspire 150 provides affordable, fast, reliable connectivity. • High-speed connectivity at a fraction of the cost. Operators can expect global, high-speed cockpit and cabin connectivity without the costs associated with installing a Ku- or Ka-band system. Global coverage even extends to the polar regions. The small antenna and lightweight system minimize weight and decrease fuel costs compared with existing systems. Honeywell's GoDirect® software is an optional component that offers connectivity services to help manage bandwidth and improve cost efficiency. These services include Honeywell's GoDirect Cabin Connectivity, which controls connectivity services and usage, potentially saving operators up to $100,000 a year. The Aspire 350's main goal is to provide safety services such as FANS and communication systems including Aircraft Communications Addressing and Reporting System and air traffic control secure voice. The Aspire 350 features a separate modem and antenna for safety services. • Dual satellite communications systems. Operators can install a second Honeywell satellite communications solution with the Aspire 350. 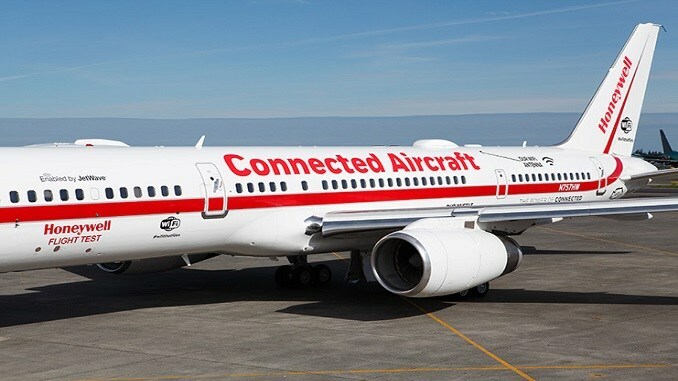 This gives higher reliability, increased network coverage, improved efficiency, and less connection downtime for pilots, crew and passengers. In the event the preferred system cannot operate, the backup system then takes over. The satcom system does not have to wait for the Iridium Certus network to operate. It can provide safety services over the current network, so operators aren't waiting for the Iridium NEXT safety certification. Both Aspire 150 and Aspire 350 can operate as standalone products to provide high-speed cabin connectivity to smaller aircraft that cannot be equipped with a larger satcom system. The flexibility of the Aspire products also allows for side-by-side operation with another cabin connectivity solution, providing cockpit safety services and backup cabin connectivity. Maritime Industry Readies for a New Era of Choice with Iridium CertusSM Global Launch Partners. Industry Leaders Ready to Offer Next-Generation Pole-to-Pole Satellite Broadband Connectivity for Maritime Applications. Honeywell Aerospace products and services are found on virtually every commercial, defense and space aircraft, and its turbochargers are used by nearly every automaker and truck manufacturer around the world. The Aerospace business unit develops innovative solutions for more fuel-efficient automobiles and airplanes, more direct and on-time flights, safer flying and runway traffic, along with aircraft engines, cockpit and cabin electronics, wireless connectivity services, logistics, and more. The business delivers safer, faster, and more efficient and comfortable transportation-related experiences worldwide. For more information, visit www.honeywell.com or follow us at @Honeywell_Aero and @Honeywell_Turbo. Honeywell ( www.honeywell.com ) is a Fortune 100 software-industrial company that delivers industry specific solutions that include aerospace and automotive products and services; control technologies for buildings, homes, and industry; and performance materials globally. Our technologies help everything from aircraft, cars, homes and buildings, manufacturing plants, supply chains, and workers become more connected to make our world smarter, safer, and more sustainable. Iridium Poised to Make Global Maritime Distress and Safety System History. Two key milestones reached as Iridium accelerates towards becoming a recognized provider of Global Maritime Distress Safety System (GMDSS).